I’m freaking out about this right now! How on earth have I never heard of these women!? I read the first article and thought “Oh, very cool.” Then I saw the video…moments ago…currently freaking out. Anybody wanna make a movie about this with me? It would be like A League of Their Own kinda. But with people of color actually doing something other than standing around wishing they could be doing something at which they, too, are really good. That’s one of my favorite movies of all time, by the way. I digress. I wonder if it’s the racism or the sexism that’s kept this a “secret.” Both I’m sure, but when I watch that video I’m mostly struck by the fact that these are women in positions I don’t think I’ve ever seen held by a woman. Not then, not now. And they came out of Mississippi!? O. M. G.
The International Sweethearts of Rhythm, the first all-female interracial band in America, faced down both Jim Crow and sexism in the 1930s and 1940s. Then, they faded into obscurity. This week the Smithsonian Institution celebrates the Sweethearts’ legacy as part of the launch of the museum’s Jazz Appreciation Month. …Ms. Hughes will facilitate an brief (10 minute) onstage discussion with six of the original Sweethearts who will participate in programming at the Smithsonian: They are Helen Jones Woods (trombonist), Ms. Hughes’ mother; Willie Mae Wong Scott (saxophonist), the child of a Chinese father and mixed race Native American mother, she grew up on Mississippi in 1920s; Sadye Pankey Moore (trumpeter), African American; Johnnie Mae Rice Graham (pianist), African American; Lillie Keeler Sims (trombone), African American woman who played with the Sweethearts their first year but later served as an educator and administrator in the NYC school system 40 years; and Roz Cron, one of the first white woman to join the band. On March 30th, the Sweethearts and Cathy Hughes will participate in a 60 minute discussion on the Sweetheart’s legacy that will be webcast via UStream. 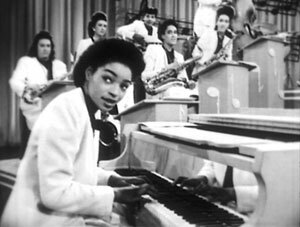 Washington (CNN) — When Rosalind Cron left home in the 1940s to join a teenage girl jazz band called the International Sweethearts of Rhythm, she had no idea what it would be like, as a white girl, traveling with the predominantly black band. At the time, Cron said she thought “Jim Crow” was a man they were supposed to meet in the South. “I didn’t realize it was a law, and a very strict law — laws, plural,” she said. State and local ordinances that mandated separate public facilities for blacks and whites made it illegal for Cron to share facilities with her band members. Cron felt the discrimination because she lived on their tour bus with the other girls, hiding her race. For three years, she said, they were like her sisters. She spent several hours in jail in El Paso, Texas, in 1944 when authorities didn’t believe the story she had made up that her father was white and her mother was black. “They went though my wallet and there was a picture of my mother and dad right in front of the house,” she said. She was sprung a few hours later when the band’s manager brought two black girls to the jail who claimed to be Cron’s cousins. By that time, according to Cron, the authorities that were holding her were glad to get rid of her. “They just told us never to return. And as far as I know, we didn’t,” she said. The risks were worth it to play her saxophone with what became known as the nation’s first integrated, female jazz band. The International Sweethearts of Rhythm were founded at Piney Woods School in Mississippi in 1937, in part as a way for the students to help pay for their education. They recruited members of different races to help with the “international” part of their image. 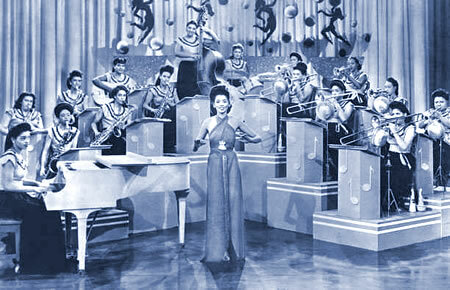 Willie Mae Wong had a Chinese father, a mixed-race mother, and no visible musical skills when she was recruited to the group as a 15-year-old. She was out on the street playing stickball when they picked her up. The name “Rabbit” has stuck to this day. In 1941, the group separated from the school and went professional. They traveled on a bus to gigs across the United States, including venues like the Apollo Theater in New York and the Howard Theater in Washington. During World War II, the Sweethearts traveled to France and Germany as part of a USO tour in 1945. Pictures and mementos from the International Sweethearts of Rhythm are on display at the Smithsonian’s American History museum for their 10th annual Jazz Appreciation Month celebration in April. Six members of the band were in Washington this week to reminisce. “It was a privilege to come from Mississippi and go and see the other parts of the world,” said Helen Jones, who played the trombone from the band’s founding until it disbanded. “All I ever wanted to do was play a trumpet,” Sadye Pankey told a group gathered at the museum. And as for music education today, she feels bad for today’s students. “Some of our schools in our country now have abolished the music, and it’s not fair,” she said. Cron told the group that if music is your passion, you need to stick with it. “Don’t let anyone come between you and your horns, or music,” she added. This entry was posted in equality, history, music, race and tagged a league of their own, desegregation, integration, interracial, jazz appreciation month, jim crow, mississippi, piney woods school, segregation, smithsonian institute, the international sweethearts of rhythm, the smithsonian institution by Tiffany. Bookmark the permalink. I wonder how I didn’t know about this! I enjoyed reading this. Yes, it should be a movie. So…DO IT! I love A League of Their Own, btw! Good stuff. I knew Roz was going to this event…and she was so very excited. She is a wonderful graceful caring giving person and I am so glad she was able to provide and share her beloved treasures with the Smithsonian as well as wonderful history and memories, not to mention be reunited with some of her sisters. Let’s keep this alive… a movie would be ideal, sooner than later so these wonderful ladies could contribute, & enjoy the end result.